NOW WE ALL KNOW that merchandise is returned to stores every day and restocked on shelves, right? But how thoroughly are those returns checked, if at all? Recently my husband shopped at the Target in Northfield and bought two pairs of jeans for our college-aged son, currently home from Boston on holiday break. These were purchased with cash as we have canceled our Target REDcard. We are choosing to be proactive rather than follow Target’s advice to “monitor our account” for possible fraudulent activity. That said, we are always please to find jeans that fit our long-legged and slender 19-year-old. Surprise. 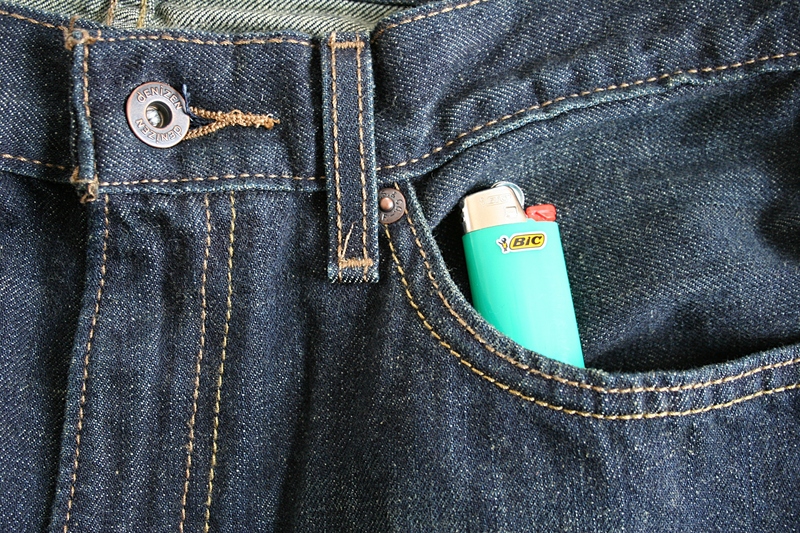 These jeans purchased at Target came with a Bic lighter stashed inside a front pocket and repositioned in this staged photo. I wasn’t pleased, though, when I discovered a Bic lighter buried in a front pocket of one pair of jeans as I removed labels to launder the pants. 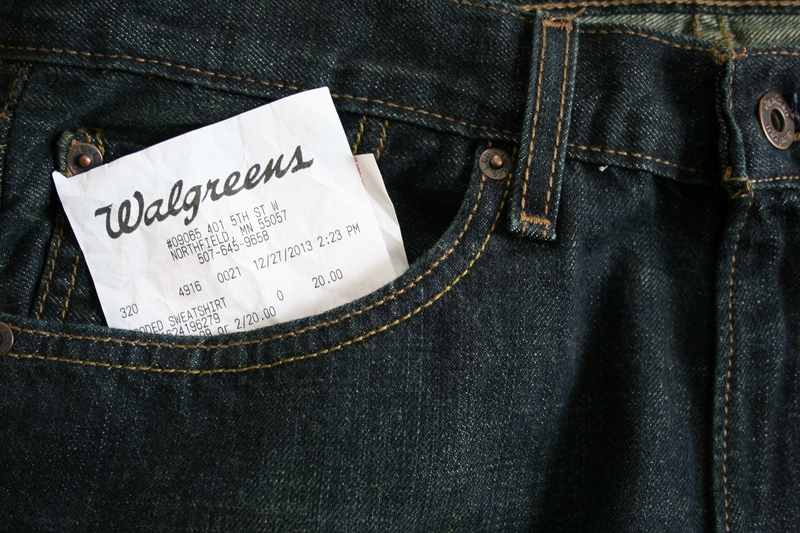 Bonus two: A receipt to Walgreens tucked into the other pocket. This receipt was visible. A receipt to the Northfield Walgreens store was tucked inside the opposite pocket. I assumed the jeans were not worn as all labels were attached and the pants appeared in new condition. So I tossed them in the wash. 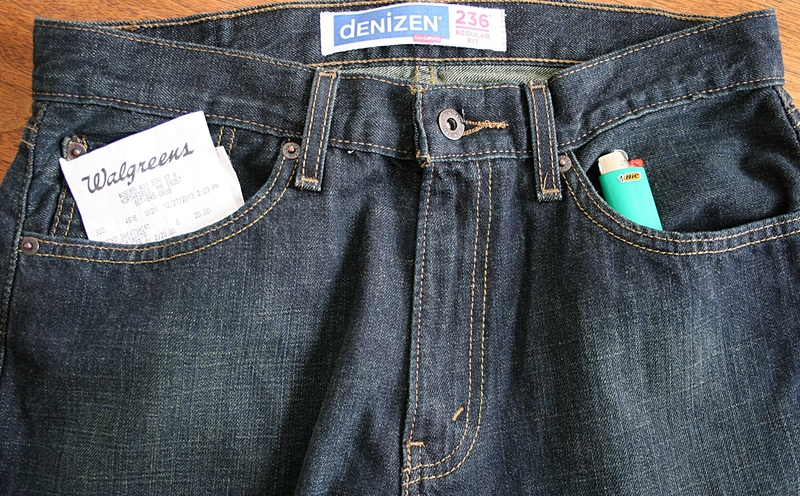 Jeans purchased at Target with a receipt in one pocket and a Bic lighter in the other. It’s a good thing I always check pockets before doing the laundry. I wish Target would do the same before restocking merchandise. But I suppose they have more important things to worry about than Bics in pockets. HAVE YOU EVER FOUND anything unexpected in the pockets (or elsewhere) of just-purchased merchandise or discovered the merchandise had been used? Let’s hear. No, I’ve not had anything like this happen to me!!!! It doesn’t surprise me, though, as I have watched how returns are merely tossed into a cart (to be wheeled to the appropriate dept. for restocking later, I presume). It is very interesting, though and sets my imagination going……………. Yes, I see the returns just tossed in carts, too, but I always assumed the merchandise was carefully checked before being restocked. I should never assume anything. Years ago, I know the returns were checked but today………………..
And a working lighter at that. OK, another thing we share in common. I can’t light lighters either. Seriously??? I have never ever been able to master it! One of my sad failures in life. Matches I can do. Alright, that’s three of us. Anyone else? I can admit that I can only use one of those long lighters that click – lighters and even matches do not like me! You are number four in the “Can’t Use a Bic” Club. Welcome! What? That is quite a story. She did all the right things to find the owner. Weird. I suppose staff are inundated with returns and things get missed. I deem these types of things a “Friday afternoon thing” where people are less attentive to the task at hand and are more focused on leaving work. I hope you had a safe commute this a.m. We had to take the son to the airport; dropped him off at 5:30 a.m. Not a good drive from Faribault on snow-packed roads. Two hours for normally takes one. Slow and steady arrives alive. Red Wing to Hampton was a white-knuckle affair. The situation improved significantly when I reached Hwy 52. People did seem to be driving for the conditions except for a few over-confident (aka crazy) drivers. We saw only one vehicle in the ditch. Fortunately I-35 from Burnsville south was plowed on the drive home. Just had to watch for occasional slippery spots due to the blowing snow. Keep it slow and steady on the drive home this afternoon. I bought a mircowave from Target in Owatonna that came in a sealed box or so I thought. I unpacked it when I got home and was ready to use it when to my surprise it was dirty inside, used, gross. The weather was slippery out and I didn’t want to go back. I called the store and one of their employees who lives in Waseca brought a new one to my home and picked up the old one. They knew I was pretty upset–ok pissed. I don’t recall ever hearing that story from you. That is gross. But great customer service to have an employee deliver a new microwave to you. Do you have any stories to share about returns from your time working at KMart in New Ulm? Now that’s just a wee bit more valuable than a Bic lighter. When I purchase my car in 2006, I found a shell (ammo) in the glove box. It was previously a rental in NY state. Uh, that’s a little frightening. That is insane! I have never experienced such a thing. So not good. Be sure to read the comments. Insanity beyond Bic lighters. Wow – some crazy stories! Can’t imagine the awfulness of that dirty microwave! Wow I’m not surprised even though its never happened to me personally. You’re right. Nothing these days truly surprises, does it? If only we could stash our cash under the mattress or in a coffee can, huh? Yes, those jeans look pretty great on the son and actually fit. Count me as another on the list as I cannot coordinate to use a lighter. Thankfully they still make matches. I think the only thing we need them for in this house is candles. I think it was my Mother (or someone she knew) who bought a new dress with fingernail/toenail clippings in a pocket! Nail clippings? That is totally gross. Yuck. Alright, Marilyn, welcome to the “Can’t Light a Bic” Club. I believe you are member number 5. Wow. I am glad it wasn’t anything worse! I agree. The stories readers are sharing here in comments are way beyond worse than a Bic in the pocket.